It's been known for a long time that robots would take over the world, even when all kids could do for fun was sit outside and play with Styx. 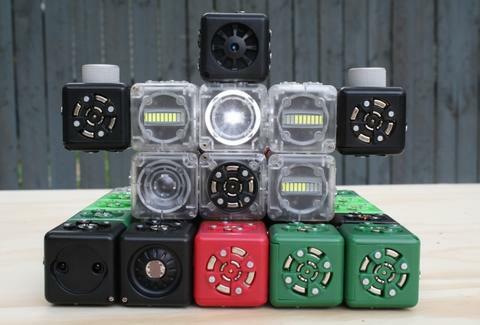 Now bringing those robots closer to taking over your world, Cubelets. Cubelets are a kit composed of 20 magnetic blocks that, when combined, make "an endless variety of robots" that can perform all sorts of different tasks (for serious), all from a guy who's got a Ph.D. from Carnegie Mellon, which he achieved through hard work, though it doesn't hurt that he's got a huge...head. Each of the 20 pieces is programmed to do a different thing, with blocks in three categories: Action (it'll drive, rotate, light up, etc. ), Sense (it can understand and "sense" distance, temperature, brightness), and Thinking blocks that include the robot's battery, the power-passing "Blocker", and the just-making-your-robot-bigger "Passive Block", which can also be achieved by throwing Theo Ratliff into the mix. If it all sounds uber geeky, just wait for it: you can do even more when you string the blocks together, i.e., put a drive and distance block together and your robot will chase a moving object; put on a "flashlight" block and it'll sense light; or put on an "inverse" block and it'll run away, though hopefully it won't then go onstage at 4am and blame its issues on Pearl Jam rather than its own out-of-control ego. For now, the company's only releasing 100 sets (which sold out immediately when they released their beta run), so act quickly, or be left with way Too Much Time On Your Hands.